It's time for another edition of the What I'd Like For You To Know series, in which I've invited some women to share some common struggles, misconceptions and victories about their particular life circumstances (for the complete series, click here.) Today's guest poster is Kelli, from Living In Grace. Kelli is the mom of two teenagers, and she's been married to John for 18 years. She is living with Stage 5 chronic kidney failure. She is on full time dialysis at home, through a peritoneal catheter. Kelli has graciously agreed to tell us about life with a serious chronic illness. On my way out to a doctor’s appointment, I stopped to check email one last time. There was an email from Shannon, asking me if I’d be interested in writing on chronic illness for her “What I’d Like You To Know” series. Whoa. Heart skips a beat. See, I’ve written about some of the aspects of living with kidney failure over the past two years I’ve been blogging but in my heart I knew I’d have to go deeper. Further into myself than I’ve been willing to go. And not because Shannon required it of me. But, because God required it of me. To go to that place I’ve been so unwilling to go with anyone. So, here I am. Laying it out there for the first time. Putting to paper those things that have been buried so deep inside me. Some background …. I was raised with chronic kidney disease. Undiagnosed with renal reflux in the 7th grade, surgery proved too late to save my left kidney. Years later, after a marriage and 5 miscarriages, I had it removed. Two healthy pregnancies followed, and for the next 15 years I was kidney problem free. In 2006, I visited the doctor for a routine checkup. And found out my right kidney was failing. After consultation with a specialist, I was put on home peritoneal dialysis in May 2006. Living with chronic illness is hard. There is not one aspect of your life that remains untouched in some way. There is no more “routine”, “normal”. Everything has a thought, a reason, a purpose. As this thing has progressed, I’m losing some things I’ve taken for granted. Walking and balance being the two most annoying. Everyday things, like standing, walking, putting on a pair of pants, taking a shower has become an orchestration of thought and resolve with sometimes comedic outcomes. I have to sit to get dressed – trying to stand on one leg and put it in a pant leg usually ends with me on the floor. I have to lean against the wall in the shower while shampooing my hair. I have one hand in the wall at all times, security and balance in just a touch. My daughter goes with me almost everywhere now, carrying wallets, keys etc. I can still drive, as it requires a different motion than standing or walking. I park in handicap spots, and have been told I don’t “look” handicapped. What does that mean? They say “You’re too young to be parking there.” Ok, so lad things only happen to old people? Uh, no. It’s amazing, when you lose the ability to walk alone for long distances, how long those hallways at the hospital become. Or the distance between the parking spot and the door. Every step is carefully thought out. Feared. Is this the time I put my foot down and my leg gives out? Will I end up at the door, or on my face in the asphalt? I will say that we have one blessing, though. My husband is able to work FT from home. So there is that help. We hope to be in a position to get him a laptop in the next year or so he can work at my appointments, as my ability to drive may come into question. The numbness that started in my feet and taken so much away has started in my hands. My fingertips are numb. Will I lose the ability to type, hold a pen, feed myself, dress myself? No longer on my own. No child should have to watch their parent go through something like this. In the last 3 years we’ve lost both grandpas and I was diagnosed with kidney failure. How much should they be forced to bear? Now. They are going to a new high school. In a new town. They do their best to help me, as does their dad. Sometimes too overly protective or helpful, but it’s their way of coping. From my standpoint, I’m learning to ask for help. There are things I can’t do, and asking someone else to do it is hard for me. I feel like a mooch. I want them to look at me and say “Oh go do it yourself” or something. Going out on my own doesn’t bother me. Well, it doesn’t bother me the way people stare when they see me walk, or stumble. However, I’ve become more reticent about going out with my family, because I feel like I’m embarrassing them. Who wants to be the one with the weird mom? It’s something I’m dealing with. Daily. The most common thing families going through a medical crisis share, but are loathe to talk about, is the financial impact it can have. Praise God for insurance. Without it, I don’t know what we would do. Well, I’d not be able to apply transplant, for more thing. They like you to be able to show the ability to, you know, pay. Even with insurance though, come those day to day impacts. I had to leave my job in November 2006, so we took a hit there. There are medication costs, deductibles, emergency room visits, and the big one …. The cost of travel to multiple appointments a month. Especially with gas prices where they are? Geesh. So I try to schedule as many on the same day if possible. Everyone seems to be anxious to spend your money. At the physical therapy appointment yesterday, they prescribed a walker. And our insurance will cover $150 or the $350 cost. The kicker? We pay the $350 up front, and they will reimburse us. In about 2 months. If they approve it. To sum it up? A friend of mine, also dealing with a life-altering issue, once said “ Home ownership? Eating out? Extras? Ha! Those are for people not dealing with things types of things …”. When I started thinking about what I would write for this, I started a journal. Putting down feelings and thoughts as they came to me, as situations occurred seemed to help me capture the day to day emotion of living with a chronic, life-threatening issue. To avoid giving you a 42 page novella, here is a simple list of things from my heart. The hard things. The ones I’ve never wanted to say out loud. o I may try to do things that I fail at, or mess up really, really bad. o I need to try sometimes. Most of the time. o Please don’t get frustrated with me for not asking for help. Please …. o Please don’t get frustrated when I do ask for help. It makes me less likely to ask for help the next time. • If you want to know something about my illness, please ask. o I don’t want to talk about it all the time. o If I’m not at a point where I’m comfortable talking about a particular thing, I will gently let you know. o There are no bad questions. • Chronic illness has no “set” answers. o Everyone will be different. o Response to treatment will vary. o If you know someone walking the same path and want to share something about it, please do. But please don’t be offended if I don’t put it into practice, or share how it was tried and failed for me. o Treatment of some chronic illness requires changes each month or so. Please don’t assume we are not “letting things run their course”. o When you are in a fight for your life, you may appear to grasp at straws, but that one straw may be the answer. o I have a hard time saying no. Help me by asking if I can do something, but understand if it’s a “bad day”. I never know until the moment. o I am lousy at asking for help. I will try to do everything myself. It’s my way of coping. o If you want to help, being specific sometimes helps. “Can I bring you some leftovers, or help you fold laundry” is more helpful than “What can I do to help”. Sometimes, I just am too tired to see the forest for the trees. o This is draining. In every way. Please don’t walk away from me if I don’t respond right away or seem snappy. o Understand that sometimes I just need space to not deal with things. I want to feel normal for a minute. o I welcome comfort and assurance, but not being smothered in it. It makes me feel weak. I can’t afford that. I must stay strong. o I will make bad decisions about everything at times, including my treatment plan. o There will be things I keep private. I’m not hiding anything from you. I need to process things before I can share them. Some things, I may never share. They’re too personal. o Humor and sarcasm are my way of coping. It’s not that I don’t take things seriously, I do. But, I need to deal as I need to deal. o Breath by breath, laugh by laugh - it works for me. o … of dying. Not because my eternal life is not secure, but because I just won’t be anymore. Be here. Be with my family. It’s hard to explain rationally, but it’s a fear. It keeps me awake at night. o … of not being here to help Kati pick out her wedding dress or hold her children as they are born. To celebrate her successes, and help her through the failures and heartaches. o … of not being there to meet that one girl who will send Jonathan’s heart soaring. Complete him as he never knew possible on this earth. Hold his children. o … of not growing old with John. Enjoying retirement together. Seeing his eyes sparkle. Hearing him laugh. Feeling his touch. Through all of this, though, I do know one thing. The one thing that keeps my head above water. That pulls me up when I start to sink to the bottom. I have hope. Hope in Christ Jesus. Someday, I will be healed. I will be whole. I Will Be Whole Again. Of that, I am completely, unabashedly, guaranteed of. And that, dear readers, is worth every appointment, every pain, every struggle. To learn more about become a living organ donor, or Kelli’s battle with kidney failure, visit her at Living in Grace. Welcome back to the What I'd Like For You To Know series, in which I've invited some women to share some common struggles, misconceptions and victories about their particular life circumstances (for the complete series, click here.) Last time we heard from Jenni, a mom of twelve. It seemed fitting today to hear from a mom of an only child. And I knew the perfect person to ask. The Queen B, the mom of a delightful ten-year-old daughter, happens to be one of my oldest friends. She is a wise and witty mother, and I know you'll enjoy hearing her perspective. I am so honored that Shannon has asked me to tell you a little bit about being the mom of an only child. I’m also a little bit bewildered. I know of many other moms of only children that could express it much more eloquently. Though I do have to say that being an only child who is the mother of an only child, I might have a certain expertise in all things only child. Oh, I’m kidding. It just means my frame of reference is rather small. And normal sibling fights really freak me out. I didn’t plan on having just one child. After two miscarriages prior to the birth of our daughter, my husband and I both felt that we would never “plan” another pregnancy. We were so incredibly grateful for a healthy baby that we didn’t dare ask for more. Knowing, however, that God is bigger than our fears, we left it in His hands. And almost 11 years later, we have one child. Without hesitation I can say that I feel as blessed today as I did on the day our daughter was born. I am so thankful for her. I can also say that I have really enjoyed being an only child. My childhood was phenomenal. I had lots of friends and never felt lonely. We must get this out of the way: An only child gets more presents than multiple children. It is just a fact. Even though less money is spent on toys and books and clothes, all of the goodie goes to one person. An only child’s toy box is often the envy of her peers. And the cause of great frustration of her peers’ parents. Only children get more one-on-one time with their parents. There are only three people in the house. It is unavoidable. It costs less to go out to eat with one child. Groceries cost less. Pretty much everything costs less. An only child will never have to share a room…or anything else for that matter. Those are just the facts. They can’t be helped. Well, maybe that present thing can be helped. We’ll work on that. I think there are some generalizations about only children and their parents, however, which are not always true. We are not all raising spoiled brats. We do not want our daughter to feel entitled to anything. She is taught to love her friends. She is taught that part of loving her friends is showing kindness to their siblings. In fact, our daughter really enjoys her friends’ siblings--sometimes more than the friends themselves. But that is quite possibly due to 10-year-old girl drama. Raising a respectful and conscientious child is just as important to me as it is to you. Another assumption is that an only child is the loneliest kid on the block. Not true. Our daughter enjoys spending time with children, but she also enjoys spending time with adults. And though it may seem crazy in a few years, right now she enjoys spending time with her parents. There seems to be a theory that parents of only children are completely selfish. They had their token child for a tax deduction. They wanted a child but didn’t really want their lives to be changed. Honestly, this is probably the belief that frustrates me the most. The majority of only child parents that I know have very serious reasons for having one child. Many struggled for years with infertility. A few had traumatic pregnancies. Perhaps they’ve been widowed. Or abandoned. Some waited years for a baby and another child just isn’t possible. And I even know a few that carefully considered what their life might look like with more than one child and they just knew it was more than they could handle. It is not always their choice and to insinuate otherwise is cruel. Now I am stepping off of my soapbox. I’d like to mention a few other thoughts for your consideration. Parents are their only child’s primary source of entertainment. You know how you can send your children outside to get out of your hair? Not so much for us. Nor can we send them to play a board game, hide and seek or catch. Raising one child is 24/7. Just as raising multiple children is 24/7. All parents have the same number of hours in their day. We all make good choices and bad choices of how we use those hours. I think it’s best that we all encourage one another—no matter the number of children. Parents of only children constantly worry that their kid has been ripped off. I recently spoke with a mother of an only child who shared with me her guilt over having one child. She was 40 when her daughter was born, and was not able to have other children. I could tell that her guilt was a very present part of her life. I totally understand that feeling. Even though I’m at peace with having just one child, I sometimes worry whether or not it is best for her. My child will never have a sibling bond. She will never know the joy of being protected by her big brother or the laughter of two sisters. She’ll never learn the give and take of sibling negotiations. And what in the world will she do if something happens to us? Assuming it doesn’t, my daughter will have to deal with two wacked out parents someday. Adult only children get the pleasure of being the go-to for their parents. It is just a guess at this point, but caring for aging parents will not be a fun solo activity. All of our family’s firsts are also our lasts. My daughter’s first day of kindergarten was the last time we had a child going off to school. My first child will go to college and I’ll be an empty nester. But I’m sure her roommate won’t mind my rollaway cot. And I’m excellent with laundry. All of the hopes and dreams that parents have for their kids? I’ve also got just one shot to get this parenting thing right. I hesitate to mention this, but here’s another big one... I’m not sure how a parent of an only child survives the loss of that child. As I was watching the Chapmans on Larry King Live, I heard Mrs. Chapman mention that she had to continue living for her other children. My heart just drops when I hear things like that. I absolutely believe that God knows the number of all of our days and he has designed each of our families. I think that moms of only children sometimes feel a little unworthy. I think we often feel like half-parents. Like our experience doesn’t have quite the value of other parents. That’s true. I will never understand what it is like to have a house full of my own laughing children. But I do have a house full of the laughter of my one precious child. To read more of The Queen B's posts, click here. Remember Ashleigh, who wrote a guest post here about what it's like having a husband deployed in Iraq? We'll, he's safely home now, and she's made a beautiful video about their journey here. And as if that's not enough joy, remember Molly, who guest posted about the grief of losing her daughter? Today she's the happy momma of a precious new baby boy, Morrow. You can read the details here. I'm just a puddle of happy tears for these sweet women. 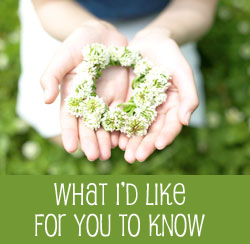 Welcome to part four of the What I'd Like For You To Know series. Today we'll be hearing from from Jenni of One Thing, one of the most delightful bloggers I know. She is the mom of 12 kids, ages 3 months to 21 years, and I've asked her to address some of the assumptions made about people with large familes. As always, she has written with great grace and humor. You're going to love her. It is quite an honor and a bit of a worry to be speaking on behalf of large families everywhere. More than anything, my prayer is that what I say will be heard with discernment and a hefty helping of salt. I don’t want to give the impression that my opinions are some sort of collective consciousness shared by all those with a veritable tribe under their roof. That said, however, I hope at least some of it will resonate! First, and perhaps most obviously, many people with larger families encounter negative attitudes almost daily. Snide comments from strangers, nosy questions about their private lives, or unsupportive extended family all combine to make the members of a big family feel more like a circus side-show than legitimate members of society. The announcement of a new pregnancy is very often not met with joy, but with condemnation (if you are on the receiving end of such an announcement, be the exception and offer a simple congratulations). I could compile quite a list of all the obnoxious things that have been said to those of us with a passel of young’uns, but I'd rather not go off on that tangent. You'll just have to take my word for it that for many people, there does not appear to be any sort of regulatory gizmo betwixt their brains and their mouths. Yet I persist in believing that it's really not that difficult to be kind, or at the very least, silent! Along those same lines, it often seems that families with lots of children are viewed with a more critical eye than those with the standard two. If a child acts up, it is of course because they come from such a large family and obviously don’t get enough attention. If their clothing is threadbare, it is because the parents must be financially strapped. If the baby has a dirty face, it is apparent that no one cares enough to clean it. Whereas a smaller family might be given the benefit of the doubt (all children throw tantrums at times, like to wear one item of clothing until it consists of three strands, and smear food upon their faces), for the larger family it becomes an opportunity to criticize. A mother pregnant with her second child is offered sympathy as she struggles with morning sickness and fatigue, but ask a mother pregnant with her fifth if she was offered any. This makes it difficult, even in a church setting, for those parents to share any difficulties they are having. I personally struggle with painful varicose veins that are aggravated during pregnancy. However, asking for prayer has sometimes been met with the attitude that such are my “just desserts” and so why would God heal me? I suspect the same attitude crops up when rebellious children, or money woes, are the issue. Parents of large families are not out to prove anything. We’re not vying for your admiration, we aren’t trying to win any awards, we don’t view childbearing as some sort of contest (someone asked my husband during our last pregnancy if we were trying to “beat the Duggars”), and we don’t think you’re less spiritual than we are if you have fewer than we do. We aren’t asking anyone for special treatment, but it doesn’t seem too much to ask for common courtesy. Resist the urge to count out loud as you see us go by. Don’t marvel that we do, in fact, know all of our offspring’s names (even—given a minute or two—their birthdates)! And for the love of all the little green men on Mars, don’t ask us if we know what causes that. We do. And we enjoy it, although not as often as is (oddly) assumed. Almost as difficult to deal with, in a way, are the effusively positive attitudes. Yes, this seems like a really strange thing to say in light of the previous paragraph, but having to decline imminent canonization is not pleasant. People who squeal, gush, flatter and insist that I must be, I simply MUST BE the most patient/organized/disciplined/loving/spiritual being ever to walk the earth wear me out. I have stopped volunteering the information regarding the numbers of my offspring mostly due to these reactions. I don’t have time to field a barrage of OMG!’s from the checkout lady at Wal-Mart while my ice cream melts. Plus, I don’t think it wins me any friends in the line behind me. Please don’t put me on a pedestal. Honestly, it’s really lonely up there. We are called to be iron sharpening iron to one another, and in order to do that we have to be able to get close to somebody. When the comments run along the lines of “You’re my hero!” and “I could NEVER do what you do! You’re a saint!” I have to wonder what, exactly, the commenters think I am doing that gives me that status. As far as I’m concerned, I’m just a woman trying to do her best with the family God has given her, and I deeply value the support of friends who don’t expect me to have all the answers. You might be surprised to learn that the average mom-to-a-gob lives her days in much the same way as you do: she gets up, sees what needs doin', and does it. One day at a time, one foot in front of the other. On behalf of my children, I’d like to encourage people to try to focus on them as individuals. It ‘s easy to let your eyes glaze over when confronted by their sheer mass, but often it seems to surprise people when they discover that my children are actually different from one another. At some point, it seems a given that any child after three or four is simply going to be a carbon copy of one of the preceding progeny. If you know children who belong to a simply humongous family, make their day by assuming they each have singular personalities. Even saying things like “Aw! You guys look all alike!” makes them feel like they are clones, or part of the Borg. Get to know them! You might be amazed at how diverse they really are. In the end, what I’d like for you to know is probably not that much different than what anyone else would say: when in doubt, extend grace. Grace is the Melanie Wilkes to the world’s Scarlett O’Hara: it believes the best even when it doesn’t understand, and is humble enough not to insist on explanations. I don’t know of a single situation where it wouldn’t be welcome! You can read more of Jenni's posts at One Thing. This is the third part of the weekly "What I'd Like For You To Know" series (background on the series can be found here). Today's contributor is Molly Piper--you can read her delightful blog here. Molly has written tenderly and clearly about her loss (for example, this post), and I've learned much from her these last few months. I asked her to tell you her story, and to help us all understand better how to reach out to a friend who is enduring grief. A year ago I was seven months pregnant with our second child. We found out at our 18-week ultrasound, much to my delight, that this one was a girl. As the last months of pregnancy ambled on, we got more and more excited. We had done the boy thing already; we were ready for a daughter. We went to the hospital, not really alarmed, but concerned. When they couldn't find her heartbeat, mine beat fast enough and furiously enough for both of us, as though it were trying to live for her. Ultrasounds confirmed that our child had died. We delivered her that day—September 22, 2007—Felicity Margaret Piper. She weighed 9 pounds, 5 ounces and was perfectly formed, though her umbilical cord was wrapped around her neck. I had no category for “stillbirth” before this. Who gets 39 weeks into a smooth pregnancy and doesn't think they're definitely going to bring home their baby? The road we've walked the past 10 months has been horribly difficult, the hardest thing we've ever walked through in our lives. Here are some things I'd like people to know about me during this time. Maybe it will be helpful for you as you love other women you know who are living through the loss of a child. Grieving is horribly tiring. It taxes the body, mind, and soul in unimaginable ways. And I'm not talking about the initial recovery of delivery. (Of course that's exhausting.) I'm talking about months and months of exhaustion. There were times when sleep evaded me at night, because of stress, shock, grief, etc. So waking up in the mornings was very difficult. And then to have the motivation to get through the daily tasks of life... yeah, that didn't happen. Most of the people who I know who have walked through tragedy talk about the effect grieving has on their ability to organize, sequence tasks, and just plain remember simple things they never used to have to think about. This has been hard for me, since I tend to be the organized one in our little family. Well, not so much over the last year. There were many nights early on when I would stare into a full refrigerator for awhile and then decide that there was no food in the house—we'd have to get a pizza. Most people won't bring up a dead child. In his book Stillborn, John DeFrain calls this the “conspiracy of silence.” Sometimes people are uncomfortable doing so; sometimes they can't think of what to say; sometimes they don't want to make the grieving parent cry, etc. So they just don't say anything. This has been painful for me since we lost Felicity—when people just don't talk about her, especially in situations where it would be pretty natural to. The friends who have initiated toward me on the 22nd of the month, or brought over a random meal or flowers, or the ones who have asked to see her pictures have been so comforting to me. I Can't Grieve on Command. I've had moments since losing Felicity where I haven't wanted to grieve. In those moments I just want to be a wife to Abraham, or a mother to Orison, or a friend to my friends. In those moments if someone approaches me and asks how I'm doing, I'm going to say something like, “Fine,” or maybe even “Good!” I don't want to open up and spill my guts just then. When people ask the question, “How are you doing?” and I suspect they're asking into my grief, it can put me in a strange position. It can actually put pressure on me to grieve...right now! This is not the person's intent in asking, but it is sometimes the unintended result. Then again I don't want people to never inquire about how I'm doing after losing my daughter. Sorry this isn't simple. Knowing that friends are thinking of my particular situation and storing up real questions to ask when they see me—questions other than “How are you doing?”—has been incredibly helpful. Those conversations go places. We really get somewhere emotionally. I feel cared for and understood; they feel let in on this part of my life. It's a beautiful symbiosis. Please Avoid the Flippant Comfort of Hallmark Answers. It's a wonderful thing to tell someone that you are praying for them or to share a verse from the Bible, but sometimes those words can feel very hollow if you haven't entered the grieving person's particular pain. Empathy is the key. Though I believe with all my heart in the sovereignty of a loving God, having someone come up to me in my sorrow and simply say, “God is sovereign,” or “God is good,” and then walk away is just not comforting. Comfort that is too packaged and composed feels like reading a Hallmark card. Remember That There's No Timetable. Anyone who took a psychology class in college learned about the “stages of grief.” I tend to believe in the stages themselves, but I don't believe there is anything linear about going through them. I find that one day I'm angry, the next I'm accepting, the next I'm depressed, and so on. My doctor said to me, “This is one of the hardest things that anyone ever deals with in their life, Molly.” That was so validating for me, and let me off the hook when I wasn't feeling “better” at month #3 or #6 or now. I've become convinced that this is a very long road, not one that can be walked in days or months, but years. Loving and losing Felicity has forever changed me. I trust it is for the good, because I believe in Romans 8:28, but it rarely feels good. I feel like a walking contradiction most of the time, confused, unknown even to myself. Friendships and situations that once felt normal feel different, because I am different. And if I don't get me, how will my friends? It must be frustratingly difficult to understand me or my grief from the outside. Nevertheless, my friends continue to uphold me, and I'm sure you do the same for your grieving friends, too. Thank you. It's hard, but I can tell you from this side of sadness that it's worth it. You can read more of Molly's posts at her blog, The Pipers. Be sure to read her entire series titled "How To Help a Grieving Friend." Today is part two of the What I'd Like For You To Know series--you can read more about the idea behind it here. I'm so eager for you to meet today's contributor. Ashleigh is the mother of two young sons, and she blogs at Heart and Home. She's also the wife of a Marine Gunnery Sargeant deployed to Iraq. I well remember the day I learned my husband--my Marine--would soon be heading to Iraq. For the first three years of our marriage, he'd been in a unit doing a job that kept him from being deployed, so while we knew that as a Marine he'd most likely be heading to that sandy spot at some point, it remained something we thought of as "sometime in the future." I remember the quick catch in my breath the moment I realized that "the future" had caught up with "the now." Shortly after our second son was born, we embarked on this, our first deployment. As I watched the buses pull away early that morning, tears streaming down my cheeks as I helped our then twenty-month-old son find Daddy amidst a sea of waving hands, I caught my breath again. What was ahead? What should I even expect? How on earth would we get through these months and months without him? I spent the first few days feeling a bit numb. I was unsure what to do with myself, even in the near-chaos of having two very little children. I soon found that going to bed early, hoping to sleep away some of the evening time loneliness, only brought hours of tossing and turning. I began sleeping diagonally across our bed to take up empty space. I searched through my recipe box for meals that could be pared down to feed only me and a toddler. Still, fish sticks, macaroni and cheese, and burritos filled our dinner plates far too often those first few weeks. Though typically outgoing, I found I was suddenly unsure of myself in groups of friends. When I headed to church for the first time alone, I had to laugh all the way from the car to the building-I made quite the spectacle trying to juggle an infant seat, two diaper bags, my purse, my Bible, a plate of muffins, all while holding my toddler's hand through the parking lot. A few minutes later I was ferociously blinking back tears as I looked for a single seat in the auditorium--a fresh reminder I was on my own now. It didn't take long to realize I'd harbored a whole slew of misconceptions regarding deployment over the past several years. I'd assumed that while the first month or two was so hard, the loneliness would subside a bit as we all got used to being apart. A friend whose husband was also deployed told me not to expect it to get any better. She was right. It's been a little over six months now since that day my husband headed to the other side of the globe. I miss him more now than I did the day after he left. Yes, I've stopped expecting to hear the door open in the evening and I'm used to cutting recipe ingredients in half, but the loneliness isn't one bit less intense. Thankfully, staying in contact at this point isn't nearly as complicated as it was when the war started. We're able to hear from my husband frequently on the phone and we've even seen him via video feed twice. The boys color him pictures and he sends them "Daddy movies." I think most military wives would agree that the evenings are the hardest. Once the little ones are asleep, and the busyness of the day has come to a close, there are still several hours to fill. Silence--when it's the only choice there is--doesn't always make the best company. That first day my husband learned he'd be heading into the war zone, I felt my heart sink. The emotions I experienced were raw and intense, and I looked ahead, anticipating what I imagined I'd feel when he really did leave. By the time we actually reached his departure, I had a myriad of ideas and expectations for what was ahead. And then it happened. He left. And it was nothing like I'd imagined. In my mind's eye I'd seen ahead to the nights when both children would be awake at the same time and there is only one parent here to get both back to sleep. I'd known both boys would have a hard time without a daddy home. I knew I would too. And yet, when I'd looked ahead, I hadn't seen Jesus there waiting for me. I wasn't experiencing His grace while just imagining what was to come. When our two-year-old cries in the night for his daddy and my heart is breaking, I feel my Lord's arms wrap around both of us, holding us close. When I wake up in the morning, unsure how to face another day and the loneliness is eating away at me, God gives grace like I'd never imagined. When my husband calls and listens over the phone to the boys playing, I know we've been given a blessing simply through technology. When I watch the news--which is purposely not often--and hear of a bombing in Iraq, the way God's peace replaces the initial fear is nothing short of miraculous. He's also shown me His love through the wonderful people around me. People who have told me they were praying for me--and they really do. The friends and family who called and kept us busy while we made the initial transition. People who still take time to ask how we're doing, call, email or send notes of encouragement. The most helpful thing of all has been when friends or family have simply called and informed me that they're going to help. I don't always know exactly what I need, and yet through many different people, God has provided what I'm not even sure of myself. People like the mother and daughter who have set aside one day a month to give me a day "off." Friends who call and say, "Hey, I'm at Starbucks. What would you like?" When we're sick--which has been, strangely, quite often this year--I've been surrounded by friends and family who come to my rescue, with medicine, diapers, food, or coming to stay with us when I've been too sick to get off the couch. I've even had blogging buddies send boxes to my husband's unit. I am unbelievably thankful for these people. God prompted them to do something... and they just did it. Sadly, there are military spouses all over the place without a support system like the one I've been blessed with. Some are the families of reservists, some are stationed at military bases far from home. It makes me realize how many times I just assumed someone had help and didn't offer it myself, or forgot to hug a wife whose husband just left. I've been guilty of being "too busy," or imagining that a phone call wouldn't mean much. Of course nothing can take the place of a deployed spouse, but reminding the family at home that they aren't entirely alone can make all the difference in the world. We're now getting closer and closer to the homecoming of our Marine. It will mean a whole new transition as we get used to having him around again. I've become accustomed to having things be my way around here! Our two-year-old has been missing his daddy more than usual lately and will be thrilled to see him. I just have a feeling he's not going to be as sure about the whole listening to Daddy thing. And the baby? He gets to actually find out just who this daddy-person is we keep telling him about. To say we're excited would be the understatement of the century. You can read more of Ashleigh's posts at her blog, Heart and Home. When Shannon asked me to guest post, and to write about "what I'd like for you to know" about my family and our journey with autism, I was thrilled. Besides the fact that it's exciting to get an audience with all of you fine people, the truth is that I have never been asked this powerful and insightful question before. Most of the time people either don't think to ask what I wish they knew, or they think they already know and there's no need to ask. I humbly accepted her invitation, and hope that after today you all understand the world in which I walk a little bit more than you did before. Day to day my husband and I share many of the same thoughts or statements about what goes on around our house. Lately as we watch son #3 regress and show us that he, too, is on the autism spectrum, the shared ideas have been much along the lines of, "Really? A third one?!". We know in our hearts that it's meant to be, and that God prepared us to be the perfect parents for these three amazing children, but we are human, and if we think about handling this life on our own we get royally freaked out. Our days are hard. Very hard. And that is something we often say to each other, "I wish people understood how hard this is". I say that with the 100% hope that you all understand that I am not trying to garner sympathy, but instead simply to gain your understanding. To "get" us. Our friends and family know that things are hard for us, but unless you are living this life 24/7, it's very difficult to describe or to fully grasp what goes on. I could go into detail about the rigid life we are forced to lead, the tantrums that are so sad and hard to deal with that we the parents sometimes cry more than the kids, the sensory issues affecting simple things like getting dressed or bathing, or the profound food allergies and refusal to eat anything most days. However, all that could be a book of details and stories and laughter and tears, and there isn't enough space here for all that. All those details make up much of our lives, but what we really wish you knew is what it's like to live with all that, and, for the most part, to have no idea when or even if any of this will stop or go away. Most of the time we are walking on eggshells, just hoping to stretch out our tiny steps long enough so that we don't break anything underfoot. Their sadness that follows a tantrum, the heartache of realizing that none of this is their fault or something they can control. The grief for how they "should" have been or grown up to be. It's all so fragile. I don't think many people know what it's like to live with constant angst on the faces of your children. The feelings of helplessness that come up from deep within us are often overwhelming, but somehow just to know that you all know, and understand, would make us feel supported. Loved. And that perhaps we aren't quite so alone. On our weaker days it seems profoundly unfair, that "normal" families deal with none of this. But on our better days we rejoice in the gift of raising these special boys. Thankful for the faith that God has in us alone to parent them, to love them, and to shepherd them into the lives they were made for. As I talked with my husband about this topic, and what else we'd like you all to know, the second most important thing that came up is that you should know that autism is not the child's fault. You may have read that and thought, "of course it's not! ", but have you ever seen a child acting out at the store, or acting weird at the bus stop or the playground and wondered to yourself why the child didn't just stop acting like that? Or wondered why the parents didn't just get control of their child? I have to admit that we don't frequent public places with my boys that often. It's so much work, and we're so exhausted every day, that we typically leave the circus for another day. But when I do venture out, I can't help but see the looks of others around me when my boys do something funky or socially "inappropriate". I want to tell the gawkers that my boys aren't badly behaved, but that they can't help their actions. I want to scream that they wouldn't be this way if they had a choice. That they'd give anything to feel normal for even one day. Almost all of the behavioral symptoms of autism have a bio/neurological cause, and therefore can't be controlled except with intervention. Even down to the flapping of hands, head banging, tantruming--all of it has a cause. Believe me, there are days that it's hard for us to even remember this, because it's tempting to get angry when things happen--yet again, but we have to slow down and tell ourselves "he just can't help it", and move on. I hope you can too. Finally, as you work to understand us better, and learn that the autism you see usually can't be controlled, we also ask you to teach these things to your own children. Chances are good that your child will be interacting with and going to school alongside someone who has autism, and so our hope is that the children can learn about their funky friends, can understand them, and can accept them. My boys are often stared at or avoided by other kids because they are different. They are still young, but I wonder what the future holds as they enter grade school, then high school, and so on. Will they ever be understood? Will they be accepted? Teaching your children about autism, and why these kids are awesomely gifted and smart and why they should be loved, is the best way to prevent the teasing and the blacklisting that has been happening way too often lately to autistic kids. With a little time and understanding, my boys make incredibly fun, loyal and hilarious friends. They have the ability to do this, they just need to be given the chance to show themselves to the world. To be someone's best friend. To be someone's soulmate. Many times families with autism wouldn't mind sharing their suffering with someone. Not just to have a pity party, but to talk about the realities of "what it's like". Don't be afraid to ask questions, lend understanding, and pass it all on down to your kids. Our family is acutely sensitive to all the little details that make life so beautiful. We need you, now more than ever, and we know that you need us too. Arianne blogs at her personal site To Think Is To Create, and you can subscribe to her feed here. If you're looking for Works-For-Me Wednesday, scroll on down. I've had an idea brewing behind the scenes for some time, and I'm so excited to tell you about it. Every Thursday for the next several weeks I'll be hosting a column called "What I'd Like For You To Know". I've invited some guest bloggers to come and post about their particular life circumstances--circumstances that are, in some instances, challenging and prone to misunderstanding. I'm asking these women to share with us some of what they'd like others to know about their struggles and their victories, and to educate us all a little better on how we might reach out to others going through similar things. We'll hear from a mother of autistic children, a young mother whose husband is deployed to Iraq, and a woman who has lost a child, just to name a few. I've asked some very excellent bloggers to participate, and you won't want to miss the wise words of these women, every Thursday.